Notes: Percentage should be based off of your most recent 1RM High Bar Squat. If you do not know this percentage, base your numbers off of the last HBBS workout. The squats should be as deep as possible! Notes: Rest while your partner is performing their round. If you do not complete all 10 of your squats unbroken, perform 5 burpees for every rep missed prior to your run. You do not have use the same weight as your partner. You will have time to change the weight while your partner runs. 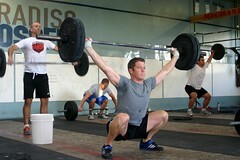 If your front rack position severely limits your weight or ROM, you may perform High Bar Back Squat as a substitute. From left to right, top to bottom: Foam Roll Lats for better overhead and rack positions, Overhead Band Distraction, Wrist Band Distraction for stronger Olympic lifting receiving position, Wall Extensions for better shoulder position, the infamous keg drill for better thoracic extension, Foam rolling the calves and achilles for better jumping and running, Foam Roll IT Band for better hip mobility, the reason we want to be mobile, the common feeling about mobilizing everyday. There is an ironic aspect to the CrossFit methodology. 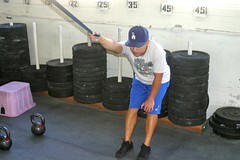 We are well known for our short duration, high intensity workouts averaging around 15 minutes. Yet somehow we can barely fit everything we do into one hour! 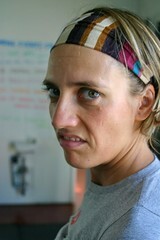 The reality of maintaining and preparing our body for these workouts can be surprising to say the least! 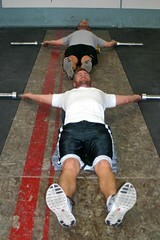 We typically provide about 10 minutes per class to warmup and mobilize and another 5 minutes at the end to cool down. While this is one quarter of the hour, it is still not enough for most people to make the kind of changes that they need! 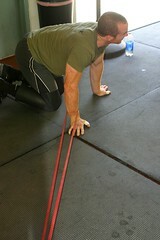 Over the coming weeks, we will be focusing a lot on Mobility and incorporating this work into the gym and your life. We will be making videos to accompany the movements from the posters. We are planning a mobility day and seminar where we can make our own foam rollers, learn how to use the lacrosse balls, rubber bands and other implements that we can perform at the gym or at home. The long term plan is to tie this all together through our video and resource libraries, by providing links that will connect movements to applicable mobility drills. Comment below if you would be interested in pooling resources to make an affordable Home Mobility Kit, including a foam roller, voodoo floss bands, lacrosse balls and assistance bands! We can have a craft party!